Hard Boiled was the last Asian crime drama John Woo made before he decamped to Hollywood and began turning out profitable but ultimately forgettable fare like Broken Arrow and Face Off. 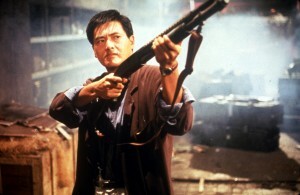 Woo’s American films suffered without their distinctive Hong Kong backdrop; and also suffered for the lack of his go-to leading man, Chow-Yun Fat. This outing has a standard-issue gangster plot and all the John Woo trimmings: hyperviolent gun fights between opponents with apparently unlimited ammunition, people flying through the air firing two pistols at once; and seemingly indestructible leading men. Police detective “Tequila” Yuen (Chow-Yun Fat) is a tough cop who plays by his own rules, the kind of guy who can engage in a blood-soaked running battle in a teahouse and walk away without a scratch, toothpick still clenched in his granite jaw. This particular teahouse shootout resulted in the death of Tequila’s partner. Tequila knows that the guys who killed him were engaged in gun-running, and he knows the goons were in the employ of an up-and-coming gangster named Johnny Wong. But he doesn’t know that Wong has key people in the police department on his payroll; or that Tequila’s estranged girlfriend (Teresa Mo) is unwittingly being used as a mule to deliver orders to the crooked cops in Wong’s employ. Our engagement of HARD BOILED is made possible through the support of Asian Media Access. The film screens Monday and Tuesday, July 6 and 7 at 7:00 and 9:30 at the Trylon. Tickets are $8.00, and you can purchase them here.